Rental Crates removes the hassle of where to buy moving boxes. We deliver Rental Crates and packing supplies to your doorstep at your convenience. Our simple checkout process allows you to select exactly what you need to pack your home or office in a few steps. The simplicity of using plastic moving boxes starts as soon as they’re delivered. Rental Crates arrive pre-assembled and ready to pack. There is no folding flaps and taping required to start using. Plastic moving containers are designed to store items from any room in the home or office. There is no need to buy file boxes to pack your files, dish boxes to pack your dishes, and book boxes to pack your books. Rental Crates are a one size fits all solution. Rental Crates are also made to transport. Each Rental Crate is easily stackable and nests in a Rental Skate. This allows for painless mobility when packing your home or office. Rental Crates are also able to to be dollied using a two wheel hand truck. Traditional cardboard boxes are difficult to transport and can become unorganized. Movers also prefer to move plastic moving crates over cardboard boxes. Plastic moving crates are easier to load and transport than cardboard boxes. Rental Crates’ uniform design maximizes truck space and saves time loading. You do not need to be a Tetris master to stack and load Rental Crates. When you are finished using Rental Crates we pick up the empty plastic moving boxes at your new location. There is no reason to store or dispose of several cardboard boxes after your move. Rental Crates make your move easier from beginning to end. Rental Crates are heavy duty plastic storage boxes. They can hold more weight than traditional cardboard boxes and last much longer. Plastic moving boxes are designed to protect your items during the entire move process. From packing, to loading, to transportation, Rental Crates are a stronger solution compared to cardboard. Rental Crates do not rip, collapse, or crush. The bottom will not fall out when they are fully loaded. Rental Crates are waterproof and weather-proof. All of these factors make Rental Crates a better alternative to cardboard when considering the safety of your belongings. Rental Crates are also more durable than cardboard when transporting. Plastic moving crates do not collapse when stacked on a dolly or loaded onto a moving truck. This means you can stack higher without worrying if the weight of one crate will destroy another. Our plastic moving boxes have sturdy grip handles that makes moving Rental Crates by hand easier than cardboard. Cardboard boxes often have uncomfortable perforated handles that tear or nothing to hold at all. Each plastic moving crate nests in a durable Rental Skate. The Rental Skate allows for secure transportation over thresholds and while using ramps. Each Rental Skate dolly has an up to 500 pound weight capacity. The sturdy nesting design eliminates the likelihood of a Rental Crate stack tipping and contents spilling out. Rental Crates are a stronger solution when it comes to ensuring your items arrive safely at your new location. There’s not much to think about, the time and money spent acquiring cardboard boxes can add up quickly when planning a move. 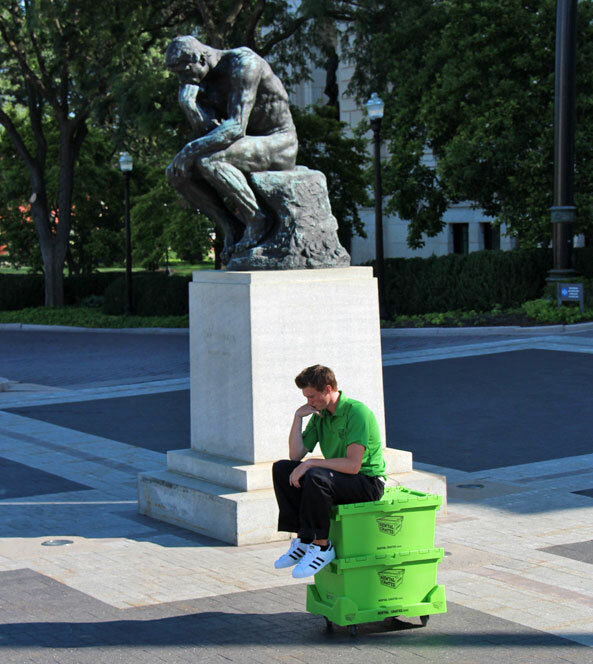 Rental Crates are delivered to your current address and picked up at your new location when you are finished. Plastic moving crates arrive ready to pack saving you valuable time. Plastic moving crates are stronger than cardboard boxes. This means you can pack more per box and reduce damages. Packing more per box with less packing materials makes Rental Crates a cost effective alternative to cardboard. Using Rental Crates will also save time if you hire packers or movers. There is no time required to assemble Rental Crates. This means packers can focus on packing your items. Movers are able to transport and load plastic moving boxes faster and more efficiently than cardboard boxes. Most home and office moving companies charge by the hour. Rental Crates will reduce the overall time spent packing and moving, resulting in lower moving costs. When you are finished using Rental Crates we pick them up from your new location. Unlike cardboard, there is no disposal fees or inconvenience to remove. Switching from cardboard to Rental Crates for your next move can save you up to 50% of your time and money. Rental Crates are eco-friendly moving boxes. 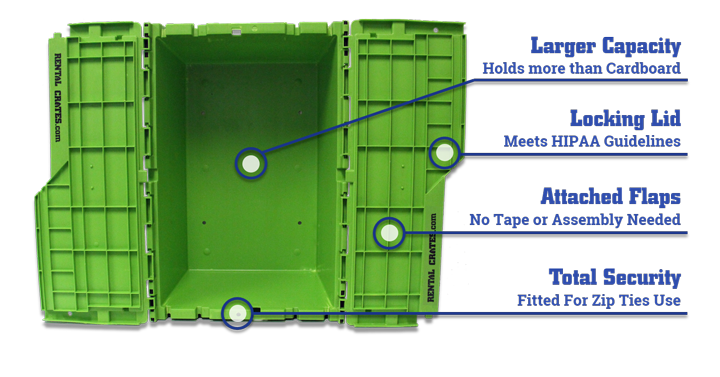 Each plastic moving crate has a low environmental impact and is reused on hundreds of moves before being recycled. The average cardboard box only survives 2 or 3 moves before it starts to fall apart. 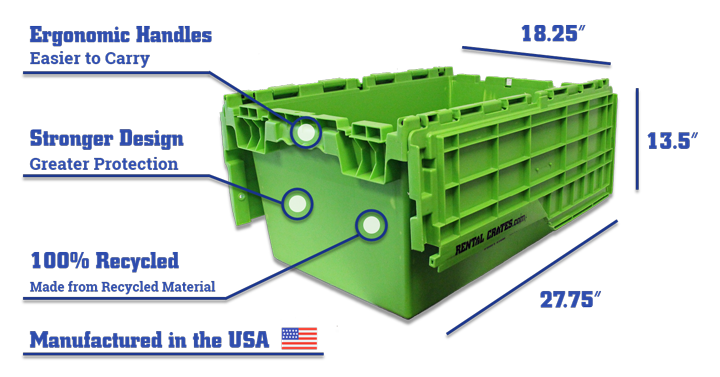 Rental Crates generate zero waste while moving. Unlike cardboard, there is no breaking down boxes and removing tape for disposal. When you are finished using Rental Crates, we pick them up to be used on another move. Each Rental Crate is cleaned between uses with compressed air. We do not use cleaning chemicals that could stain or damage contents. Our Rental Crates are inspected before each delivery to insure that our customers are getting the cleanest crates.